Joy Gryson takes bohemian style a step too far with this Columbier bag from her Olivia Harris line. Hobos generally have a relaxed hippie charm about them, but most manage to pull off the look with more style than this. 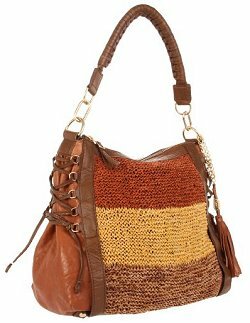 The earthiness of the woven panel sounded good in theory, but the straw doesn't gel with the leather we see on the rest of the bag. I might not have minded the contrasting sections if they were the Columbier's only accents, but with the lacing and oversized tassels vying for attention the design seems really overdone. It's a shame its exterior seems so tacky, because the Columbier is actually a smart handbag. Its main compartment is spacious and well appointed with a hardy lining and trio of interior pockets. The flat base helps the bag sit up straight once its set down, and with metal feet its leather finish shouldn't scuff. Its materials make the Columbier's $475 price tag seem about right, but sadly its looks let it down. The Olivier Harris by Joy Gryson Columbier Simple Tote bag, a great alternative to this woven bag.